1. With Snapchat open on your phone, point your camera at the yellow snapcode. 2. Hold your finger on the screen over the code. 3. 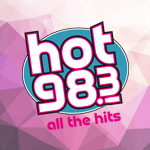 Your camera will find the code and ask you to download the Hot 98.3 Snapchat filter. 4. Take pictures and videos and send them to Hot 98.3 on Snapchat and Facebook! The best ones will be used in our very first viral video! 3. Your phone will ask you to download the Hot 98.3 Snapchat filter.